As winter melts away and spring weather ushers in a new season of life, the students of Huntsville have a physical reminder of the passage of time. For seniors and their families, it can be an especially bittersweet season. It is a season that with every rain as well as every sunny day points them back to the hope they trust in, the hope they cling to, the hope they can rely on. At the end of one season of life, it is helpful to look back and reflect on deep valleys and storms and to ponder how each trial revealed God’s faithfulness and compassion, how each struggle revealed the truth that we are dependent upon Him and that our God is a trustworthy stronghold in hard times. The prophet Samuel found that to be the case. He describes raising an Ebenezer, or stone of remembrance. “He named it Ebenezer, saying ‘Thus far the LORD has helped us’” (I Samuel, 7:12). As Israel continued down the road, they could look back and see a visual reminder of God’s faithfulness to them. High school graduation is a special time to look, ponder, and remember God’s faithfulness to the children Southwood has been honored to walk alongside in life—to remind the parents, the teachers, and the graduates of those Ebenezers that mark the painful path of growth. It is the deep and abiding hope of Southwood’s youth ministry, High-Life, to teach the word of God so students will know the character of God. It is the desire of High-Life to have adult leaders be witnesses to God’s work in the lives of students. It is the church’s hope to provide an opportunity to be with a group of sinful saints worshipping God each Sunday and to serve alongside people of all different stages of life. The leaders also long for the students to experience the grace of God in their own lives, that they might raise up Ebenezers themselves that remind them of dark valleys and hard situations where God’s faithfulness shined brightly in the dark night. As seniors graduate and embark upon a new and unknown journey, there is a natural feeling of excitement and joyful anticipation. It can seem as though one lifetime is not enough to enjoy all the opportunities life can afford! And yet there is certainly disappointment and struggle in the days and months before them. There will be suffering and pain. The students and parents will be called to endure things they cannot predict, dreams that are shattered, and pain they do not want. How can we be hopeful in a future that is beyond our control and that certainly holds such valleys? A youth pastor at Southwood once had a parent ask a valuable question: “Can you keep my son safe on the Mexico mission trip?” He replied that no, he couldn’t protect himself or anyone else from pain or suffering, but that he could trust the Creator and Sustainer God, who suffered greatly for us to be our ultimate hope. His truthful and loving answer pointed to those Ebenezers and the faithful God behind them. It is those Ebenezers that point the way for us in the valleys. They point the way to the cross, where a faithful and compassionate God proved his love among us, so that we might know and rely on the love God has for us. No one has suffered more, sacrificed more, or loved more than Jesus for the joy set before him of winning his people to himself. And that is a love we can depend on, lean into, and rest in. 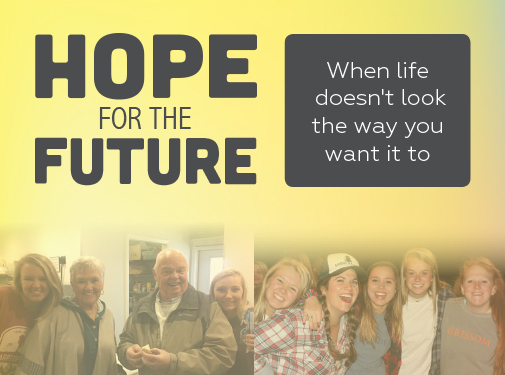 What do you put your hope in, and how might you join in with the saints in pointing high school graduates and their families to the faithful God and his unfailing love? How has God revealed his faithfulness to you even when it turned out differently than expected?